Customize your personal style by creating your own jewelry. In this introductory class, the instructor will lead you through the process of making either a necklace or a bracelet + pair of earrings. 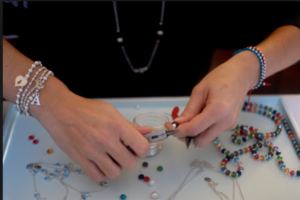 This class is designed for those who have little or no experience with jewelry making. Please enter through the 5th Street door. Teaching Artist Bio: Sharry Sherman has been designing jewelry for over ten years and has taught several classes for ACE in the past. Her work is well known in Union, Baker and Wallowa Counties. She participates in Farmers Markets, Bazaars and Art Shows in each of these areas.